It is difficult to say what the true reason behind this shooting actually was. If the typical theories behind staged false flag shootings—that Deep State interests were orchestrating shootings in order to push for anti-gun legislation—applied here, the act would not appear to make sense. YouTube has directly opposed and censored these false flag theories on their own platform. If the theories of previous false flags were correct and there were monetary interests behind the shootings pulling the strings (and there does appear to be), it would not make sense to hit their own cover-up artists (at least not under normal circumstances). To add, it would not make sense if those behind the recent school shootings intended to frame the opposition, i.e., the pro-gunners. Though this framing was allegedly the intention behind the Comet Ping Pong false flag that took place during the time when the Pizzagate scandal first broke, this tactic would not make sense in the case of the YouTube shooting. There may be another explanation for this event. It could be that those behind this shooting at YouTube intended to use the incident for two different objectives. The first would be to, once again, blame guns for the countries problems. Along with this blaming of inanimate objects, those behind this shooting may have intended to blame Conservatives—possibly the same Conservatives they chose to censor and unethically delete from various social media platforms. These do seem to be possibilities, but even still they do not seem to be very likely—unless, of course, these interests were acting out of thoughtless desperation. If the interests behind this shooting intended to blame deleted YouTubers, they would have to admit their unethical policies and risk drawing attention to their own foul play. Also, the shooter pulled the typical false flag move by opening fire and then turning the gun on herself. If this event was premeditated by the suspect, one would think the situation would have turned out differently. According to the video interview below, it sounds as though the gunman had a specific target and at least two other secondary targets. It is also clear from the description that the shooter went to excessive lengths to make sure that at least one of the targets was killed (contrary to the mainstream narrative). It has been theorized that MKULTRA programming along with psychiatric drugs were used on previous mass shooters. Otherwise, it is not likely these individuals would have behaved in the exact same way. The second possible reason for which an MSM-aligned platform might be targeted would be a clean-up operation. Not only would such an operation serve as an excuse to demonize anti-establishment perspectives and pro-gun proponents, but it would strike fear into any employee who might otherwise squeal on the bad actors who are believed to be behind YouTube and Google. No matter the reasoning behind these events, these incidents are tragic and completely unproductive to both sides of the argument. No matter our opinions, it is important to value life and all those involved. Our thoughts and prayers are with all of those who endured this tragic ordeal. 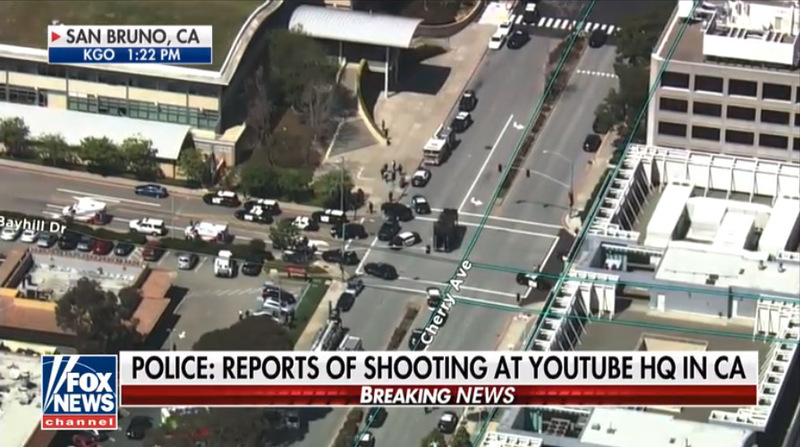 Police confirmed Tuesday that a woman believed to be a shooter opened fire at YouTube headquarters in San Bruno, California, wounding at least four people before apparently killing herself. Three people were transported to San Francisco General Hospital, according to a spokesman, including a 36-year-old man in critical condition, a 32-year-old woman in serious condition and a 27-year-old woman in fair condition. KGO-TV reported the shooter was believed to be a white woman wearing a headscarf and a dark top, but police did not immediately confirm it. Witnesses told KTVU that the suspect shot her boyfriend before killing herself. According to the Los Angeles Times, authorities said the incident did not appear to be terrorism. 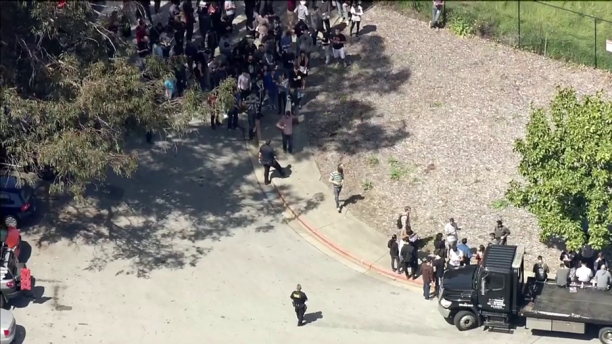 San Bruno Police confirmed on Twitter that they were responding to an active shooter. They previously tweeted there was police activity at 901 Cherry Ave., where the company's campus is located. They advised the public to "stay out of the area." President Trump tweeted that he was briefed on the incident and added "Our thoughts and prayers are with everybody involved." He also thanked law enforcement and responders who are on the scene. White House Press Secretary Sarah Sanders previously told Fox News that the president was briefed and they were monitoring the situation. San Bruno City Manager Connie Jackson told KTVU the situation was "relatively secure" about an hour after the gunshots were first reported. Users on social media indicated that ambulances were arriving and nearby offices were on lockdown. Many claimed there was an "active shooter." Todd Sherman, who identified himself as a Product Manager at YouTube, claimed on Twitter that he was in a meeting at the building when they heard people running. He said he and others made their way to the exit and at one point when he "looked down" he "saw blood drips on the floor and stairs." He said he saw authorities on the scene and added that he was now on his way home. Regarding the situation, Google Communications tweeted that they were "coordinating with authorities and will provide official information here from Google and YouTube as it becomes available."